If you are looking to get your kids involved in some form of active watersports, or maybe you have a holiday planned somewhere that has fabulous opportunities for snorkeling that you can all enjoy together as a family, then right about now, you could be considering investing in a youth size wetsuit. Save on paying the costs of endlessly renting a suit and just imagine the excitement of your child owning their own wetsuit! Children go grow quick though, so you don’t want to be breaking the budget with something that they will either outgrow before you next hop onto a flight, or that just won’t get used frequently enough to justify the expense. Step forward the Lemorecn Full-size Diving wetsuit which offers exceptional value for money with fabulous quality and extensive commendable features. 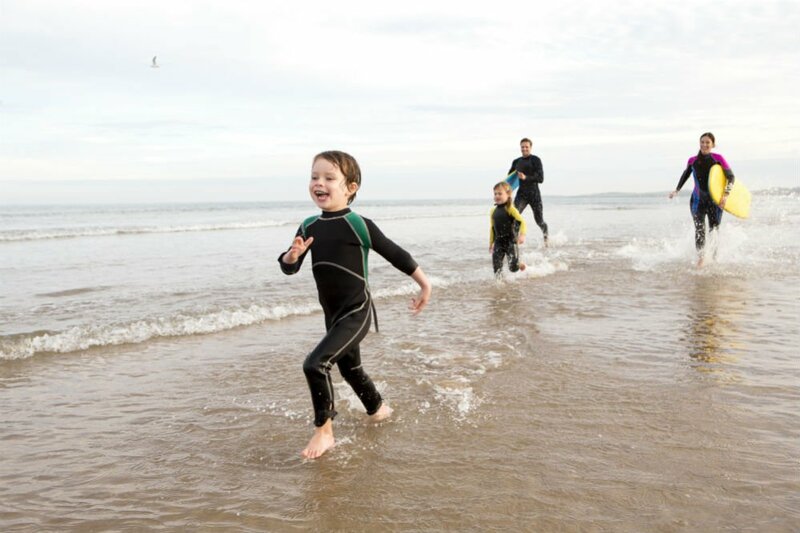 It really is a brilliant first wetsuit for the kid in your life and perfect for diving, paddle boarding, kayaking, surfing, snorkeling or getting children interested in outdoor swimming. Plus they are going to look super cute and stylish! So let’s take a look further at this great option from Lemorecn in our latest kids diving wetsuit review. We’ve already mentioned that it’s affordable and we really do think it offers exceptional value for money, especially given that it’s made out of quality Neoprene, like adult wetsuits. There’s 3mm thickness around the chest paneling to help provide additional warmth across that larger and more expansive body part, whereas the arms are a slightly thinner 2mm, so there’s no compromising on flexibility. That’s important for youngsters as you want to encourage and foster confidence and lots of movement and mobility in the water. Even if your kids aren’t ready for extreme aquatic adventures just yet like surfing and diving, this is an excellent wetsuit for them to have for regular trips to the beach. It comes with 50+ UV shield protection against the sun, so if you have a fair-skinned child, then a full body wetsuit is going to be great to support and protect them going in and out of the water and will minimize sun exposure. Lemorecn has designed this diving suit specifically with kids in mind with a pant zipper that provides easy entry and exit. We all know how impatient kids can be and those constant trips to the bathroom can be tiresome and troublesome! The 3mm neoprene thickness too will deliver just the right level of warmth and protection so that kids can enjoy diving and snorkelling for that little bit longer than they would without a suit. Bear in mind though that 3mm isn’t that thick so it’s better suited to warmer water conditions and sunnier climates. This wetsuit is for the little nippers in your life you are about to set out on their exciting aquatic adventures and discover the wonderful world of paddle boarding, surfing, kayaking, perhaps even their first underwater dive, or just for hanging out and looking oh so cool and stylish at the beach! It’s never too young to get your kids actively engaged in all the wonderful water sports that there are on offer and in this Lemorecn kids wetsuit they will be full of confidence as they have fun in the water. Better still, as a parent, you will be safe in the knowledge that they are properly kitted out, protected and kept warm, as well as being shielded from those potentially damaging UV rays. You get the 3/2 millimeter full body youth’s suit with zipper available in your choice of either Black or Black/Blue in a comprehensive range of kids sizes. Designed to increase warmth allowing children to dive, snorkel, and scuba, longer, and warmer. You get an extra-long, easy to handle leash with YKK zipper, hidden key pocket and also knee pads. This suit is warm and durable and has been anatomically designed and constructed to fit just like a glove. It is manufactured from high-quality Neoprene and with super comfortable flatlock seams. It is a super versatile, entry-level youth suit that would be perfect for a whole host of water-based activities including pursuits such as diving, scuba diving, snorkeling, wakeboarding, paddling, sailing, surfing, and endless beach and poolside action. It’s been designed in a range of sizes to fit kids from six years old up to 14. With a similar cost-effective price tag and also in a full length 2.5mm thick Neoprene, we also like the look of the Akaeys suit that comes in a more expansive range of colors that will appeal to both boys and girls. In particular, we really love the grey and green colorway which is super fresh and funky. Again it comes with a sturdy but easy to access and operate zip and is also chlorine resistant as well as offering UV 50+ protection. If you are looking to invest in a first wetsuit for a youngster under the age of 14 who’s going to be using it in the summer or in warmer temperature water, then the Lemorecn Youth 2/3 Full Diving Suit really does offer exceptional value for money in a full length, high-quality Neoprene suit. There’s plenty of warmth without sacrificing any of the flexibility plus the addition of the UV50+ protection really does a great job at protecting your precious kids from environmental factors and sun exposure. The zipper has been uniquely designed with a kids anatomy in mind and also to allow for quick, easy, comfortable and convenient entry and exit. We highly recommend this wetsuit, and we’re sure your budding water baby will be diving straight into the deep end once they get their very own wetsuit.